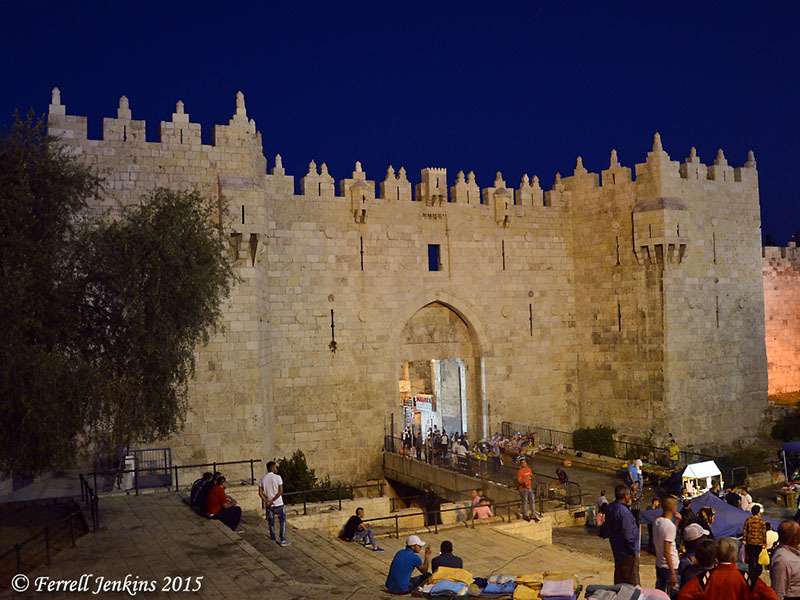 After dinner this evening we went to Damascus Gate to try our hand at some night shots of the Gate. Here is one of my resultant photos. Damascus Gate at Night. Photo by Ferrell Jenkins. Damascus Gate is the main one of three gates on the north side of the Old City wall in Jerusalem. The gate we see was built over a gate from the early second century when the city was rebuilt by the Romans, and likely over the earlier gate from New Testament times. The gate is called Damascus because this formerly was the way one would depart Jerusalem to head for the city of Damascus. Paul may have used an earlier gate when he made his way to Damascus to locate and bind followers of Christ and bring them to Jerusalem for trial (Acts 9, 22, 26). The weather was pleasantly cool this evening. Earlier in the week in Tiberias we found the 104° to be uncomfortable. This entry was posted in Archaeology, Bible Places, Bible Study, Book of Acts, Israel, New Testament, Photography, Travel and tagged Damascus Gate, Jerusalem. Bookmark the permalink. Such a warm looking photo–night enhances the look. Keep on keeping on. I appreciate so much your sharing! Such a fascinating place and full of history. The sky looks am amazing shade of dark blue in your picture. Wonderful photo! I would love to travel there someday!